Posted on May 25, 2016 by Nicole G.
Meet your every day immigrant Prenna. She comes from a place very different than our own. Because it isn’t where she came from – but when. Her future is an awful place so she, along with other like minded time travelers, take refuge in present day. But along the way, they must never try to rewrite history or worse, fall in love. Through the course of the story, Preena will break both of these rules. All because of her long time friend Ethan who is able to see who came from the future. He helps Preena adapt to card games and other things she isn’t used to while she eventually tells him about how different the future is. When a mysterious stranger tells her to change a single event that could change the world, Preena delves deeper into a greater conspiracy she didn’t know existed. Going against every rule her society created, Preena must figure out what to do before time runs out. As far as time travel books go, this book purely goes one direction and stays in the present day. As the title suggests, there is a seize the day/ don’t just survive but live themes going on, but they don’t make much of an impact. The characters are fairly generic and corrupt society Preena runs from is really one dimensional. The main focus is the romance, which somehow feels a bit like insta-love despite Preena knowing him for years. Preena and Ethan have their cute moments, but other times their chemistry felt forced. Not a bad book, but not spectacular either. It’s great as a light reading book to pass the time. 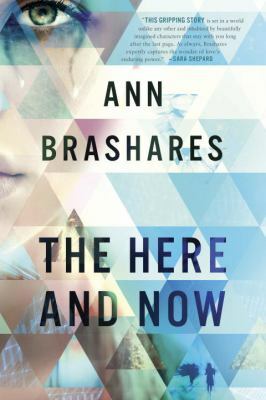 The Here and Now is available for check out from the Mission Viejo Library. This entry was posted in Book Reviews and tagged romance, time travel by Nicole G.. Bookmark the permalink. Interesting book, I can’t wait to read it!